It's hard to believe it's time to think about back to school already, but now's the time to organize and get ready for those early morning and restructured days. 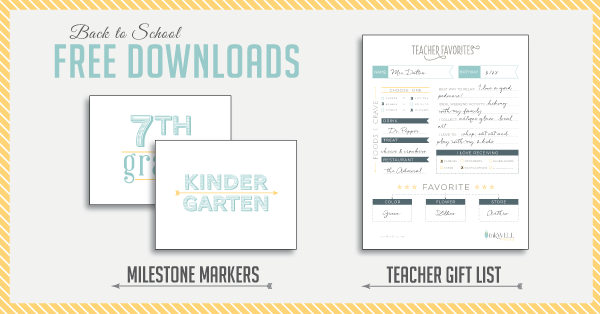 To make things easier I've created a set of Back to School Downloads which you can get for FREE! I've divided my back to school freebies into two parts… today I'm sharing part one which helps focus on that first day of school. 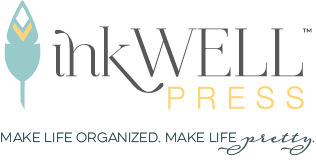 I'm so excited to share my editable teacher favorites pdf. It's designed so you can email it directly to the teacher and have them fill it out online - no printing necessary! It's perfect for finding out a little bit more about your child's teacher - and makes gift giving even easier. As a former teacher myself, I always loved it when parents went the extra mile to find out what I really wanted. As a parent now I always make sure that I show my kids' teachers that I appreciate them by giving them a little gift that I know they will love! The download includes instructions and tips on how to use the teacher favorites form. Also included in part one of our Back to School Freebies is the back to school sign for your child to hold on the first day. We've done a first day of school picture every year since Jack was in Kindergarten… and every year I spend the night before making up signs for them to hold. I made these nice and simple so that it's not using crazy amounts of ink and the focus is on the kids faces. I love little simple traditions like this because I feel like these are the things that the kids remember each year - plus it's so fun to pull out these images on the last day of school and compare how much they've changed. (Remember, I did that back here when Kate was in Kindergarten). 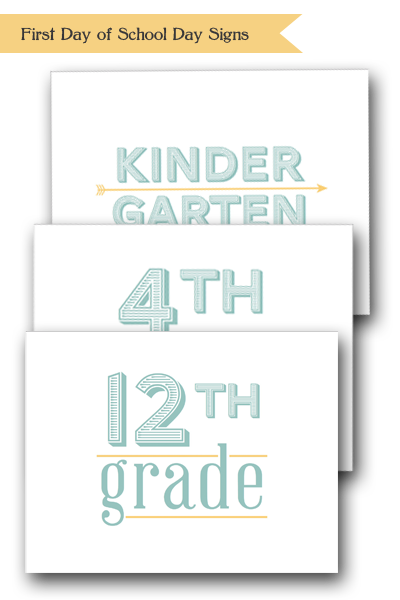 All of these downloads are designed to make life a little bit easier for you as we transition from the lazy days of summer… next week, I'll be sharing part 2 of my Back to School freebies! 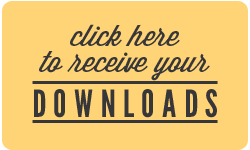 Just click here to download the files. Enjoy. 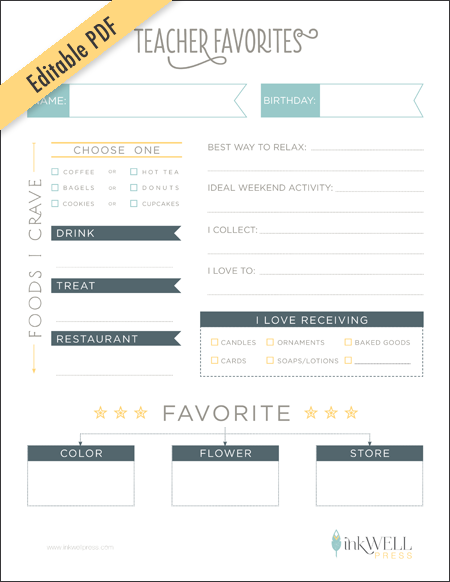 Oh, and feel free to share the freebie love on Facebook! Your friends love freebies too! These are wonderful and I am going use the teacher wish list for my daughter's 1st grade teacher. Thanks again!